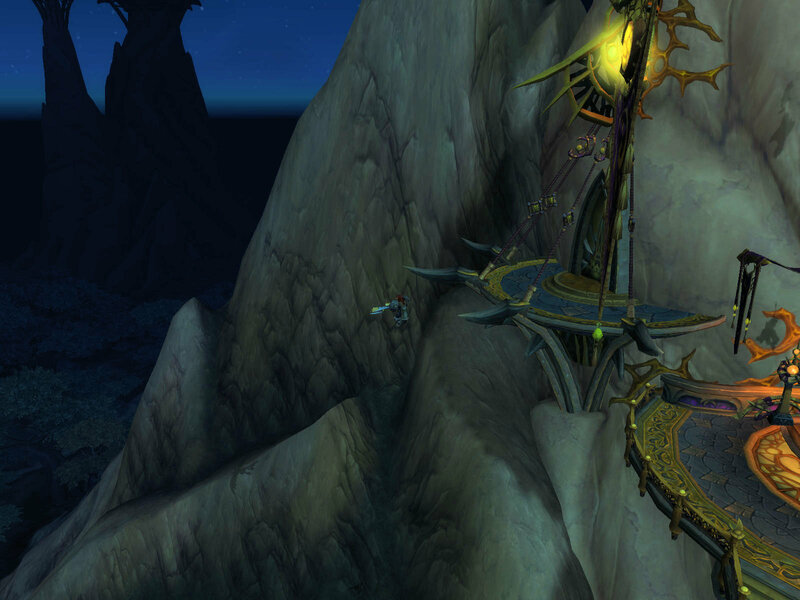 After our last run, which brought us through Auchindoun, we spent a week off getting everybody up to the minimum level to get into the next dungeon on the list, Skyreach. Take my complaints about level locking dungeons from walk-ins as read. Fortunately, the goal was pretty modest and we were all at that minimum, level 96, when last Saturday rolled around. Skyreach is out in the Spires of Arark, out at a flight point that only a couple of our group characters had, Skronk and Earl to be exact, and we had to walk in, because Skyreach is locked until 97 if you want to use Dungeon Finder. But that was fine, we walk in by tradition, so those two flew out and summoned us to the stone. Tistann was first, and he joined in the summoning. Sorry, I just had to use that screen shot because of the expression on Tistann’s face. There we assembled, wondering how we would do. 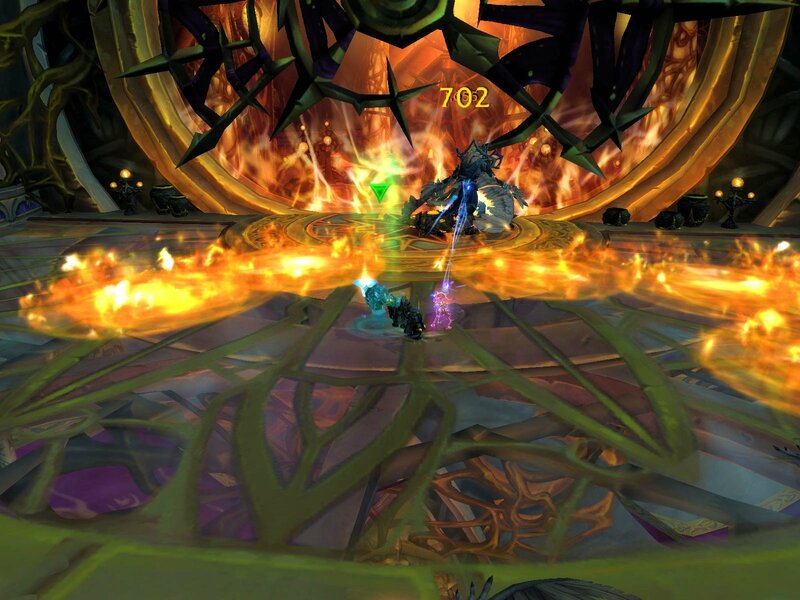 As I mentioned before, four of us went in with level 100 alts, led by Earl’s “done all the raids, got all the upgrades” insane fury warrior, only to get out asses handed to us on the first boss. Healing on the move was a problem, but we should have had enough DPS, to my mind, to blow past on that alone. Instead we wpied six times and called it a night. So facing this with five level 96 characters seemed like it might be a challenge. I did go grab Alioto, who does inscription, and made Bigbut an item level 630 staff for his monk so as to up our game a little bit, but otherwise we were going in pretty much as we did in Auchindoun, which barely added up to a faceroll for out four level 100s. We got in, buffed up, and started, getting ourselves into a bit of trouble almost immediately, at the second fight. We engaged one group right as a mobile group walked into aggro range, which gave us a lot of targets and we ended up with a couple of deaths. 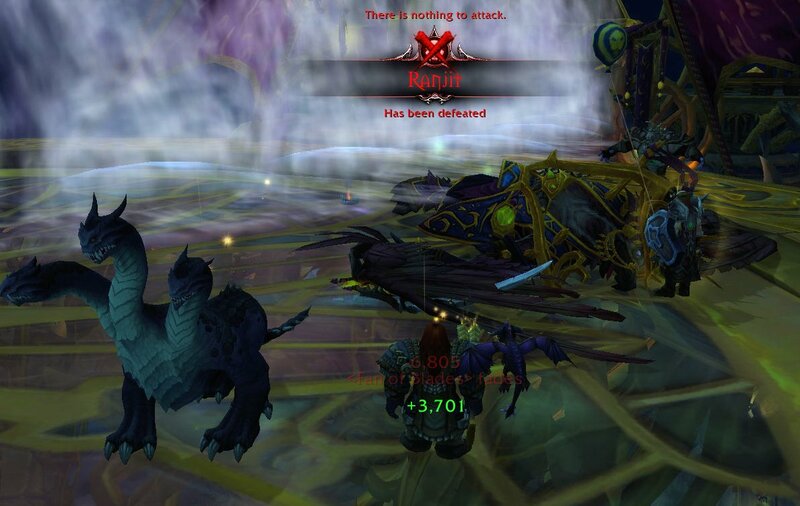 That was sloppy, but we learned from it and used a bit more care, clearing the mobs right up to the first boss, Ranjit. I am still not sure who brought the shirtless lumberjack in that shot. We went through what to expect and what we had learned from our past fiasco, which largely amount to “stay moving and stay out of the wind.” Skonk had changed his priest spec from discipline to holy base on our experience. Then, with nothing else to say, we ran in and started the fight. In with a hunter, who can fire on the move, the fight wasn’t too bad for me. I had gone in as melee DPS with the 100s, and the wind is always a problem then. However, nobody else seemed to be having much of a problem either. Skronk especially seemed to be holding up and keeping people healed. So, after a few minutes of running all over Ranjit’s platform, he went down while we were all still standing. That was something of a “wait, what?” moment. The fight wasn’t super easy or anything, it was more a matter of the five of us (which amounted to considerably less combined DPS) working with our regular group characters managed to keep it together long enough whittle Ranjit down. The fight easily took as long as any two of our level 100 wipes. We let that sink in for a moment, then started on toward the next boss, Arknath. Anyway, we blew past him and around to the next platform and Rukhran, who has a set of mechanics we had to figure out. First there were the birds on the platform that we need to kite around to kill. Unfortunately, kiting around managed to aggro the whole set on the platform, causing a wipe. But at least we had most of them down, so the return was just a clean up operation. Then it was on to Rukhran himself, who summons flaming bird minions from piles of ash who go after specific party members. You have to put DPS on them and kill them before they reach their target, or they explode for many, many dice worth of damage. However, if you kill them right by any of the piles of ash… and when you kill one it leaves a pile behind… another one will spawn. Or something. We were figuring this out as we went along and managed to wipe on the first go. The second run through, however, we managed to pull it together and at least make less mistakes, bringing Rukhran down. 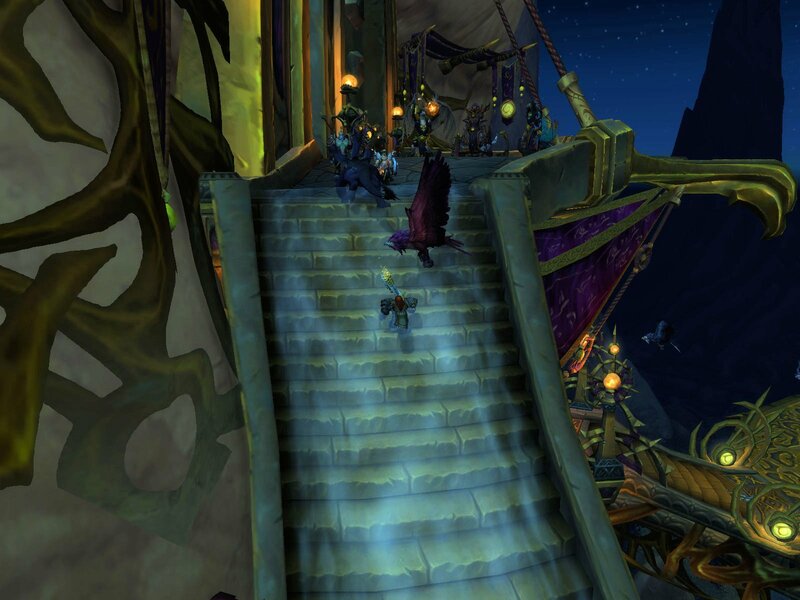 After that, we were on to the most deadly part of the whole instance for me, the windy stairs. Seriously, after Rukhran there are some steps up to a platform, and some steps up from there, that are plagued by winds trying to blow you off the platform. The first bit is fun. I ran up the stairs and let the wind blow me back down, ha ha. And then I got to the platform. There you have to get in the right groove and go the long way around to get to the second bit of stairs. I first tried to go straight through and got blow off to my death. Then I tried to run a shorter route through the platform and got blown to my death. Then I again I got caught in the wrong guest, but Skronk hit me with Leap of Faith and pulled me up to the top of the stairs, saving me. Ula got through easy because she used blink to get across, while everybody else seemed to have figured out the pattern of the winds on the first try. And then, of course, at the top of the stairs we managed to pull aggro on everything, wiped, and we had to go through the wind again where I managed to die because I managed to get hit by all of the birds… they wait for you to pass and take a run at you… on the way back for another death before finally making another trip up the far stairs. As Skronk had his Hypnocroak platforming problems, I had my wind issues. 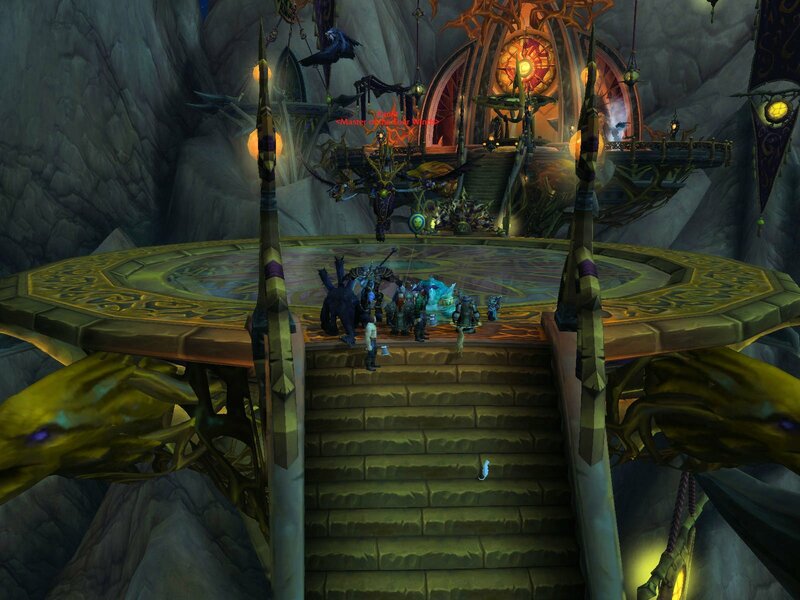 After that, we cleared the rest of the trash, we were left at the final platform facing the big boss, High Sage Viryx. The Viryx fight is one of adapting to mechanics. He bombs the crowd. A mechanical assistant shows up and shields him, so you have to kill the assistant. 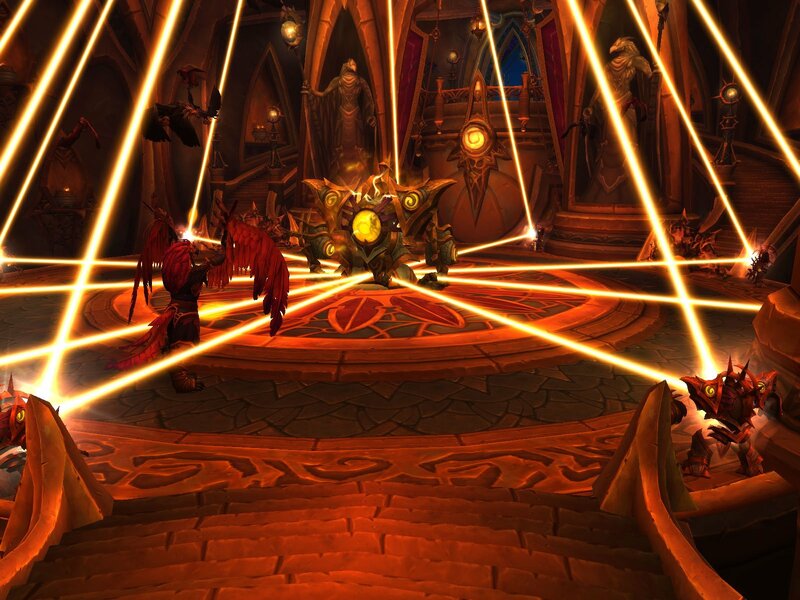 He has a giant laser that targets people, which you then must run from without dragging it over your comrades. But the most exciting dynamic are the Solar Zealots he summons, which pick up a player with the intent of dropping them over the side of the platform to their death. All of that ends up keeping the ranged part of the group in motion quite a bit. The Solar Zealots were certainly the most troublesome and, like back at Arknath, a good reason not to blow your cool downs until you really need them. I was the first to get picked up, then Ula, then Skronk, then me again. We managed to save people, burning down the Solar Zealots and then returning to the fight, while Earl and Bigbut continued to keep the boss busy. 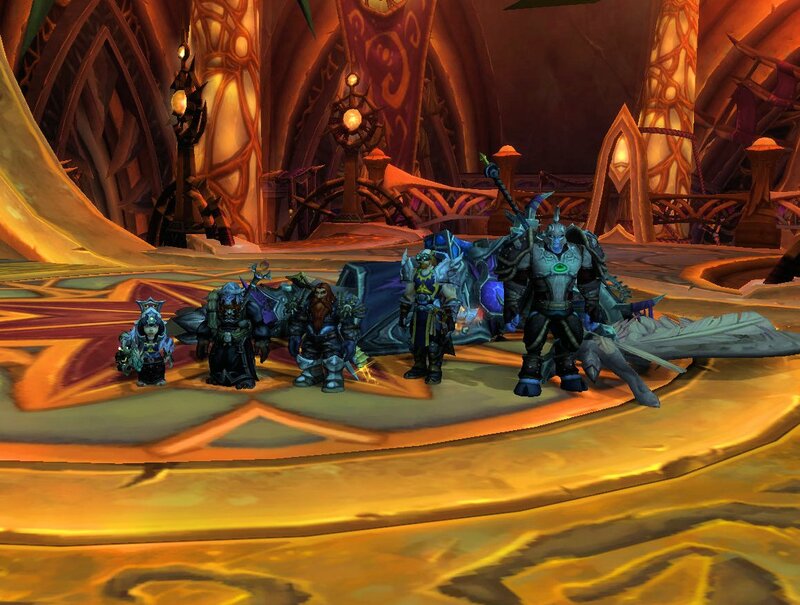 Our dancing around was a success and we brought Viryx down and got the achievement for the instance. However, that happened while I was in the grip of yet another Solar Zealot and, having been caught too close to the edge of the platform out of focus and on cool down yet again (having poured everything into the last bit of Viryx) things looked grim. 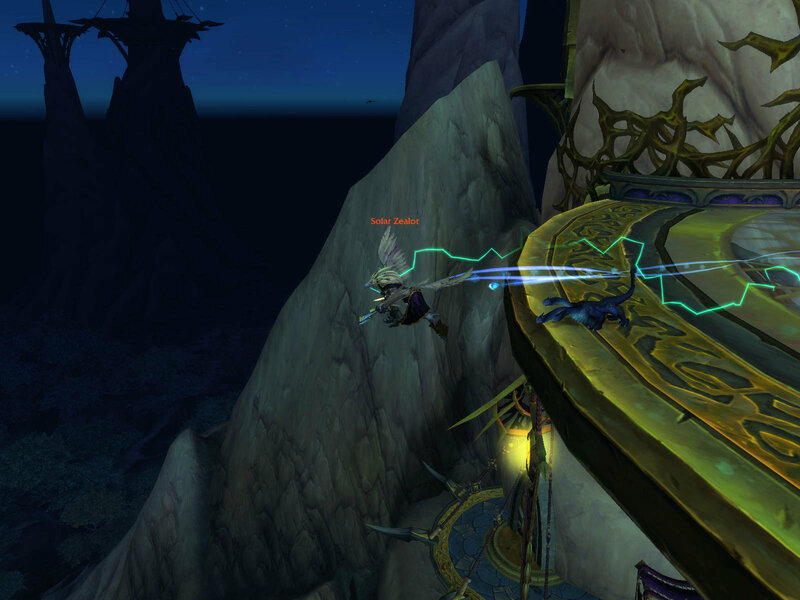 Sure enough, before we could kill it, the Zealot dropped me and I plummeted to my death. So I had to release and run back up to the group. Fortunately, at that point, the wind was turned off on my personal platform of death. It was time for a screen shot of the group. All in all, that run did not take us very long, so we outside, reset the instance, and did it all again. Earl, who runs an addon for boss fights that, among other things times your fights, reported that our second run at Ranjit took less than half the time. In fact, we shaved time off of all of the bosses and managed not to wipe. I even made it through the wind without falling off. So we seemed to have mastered Skyreach on normal mode, and picked up some upgrades along the way. 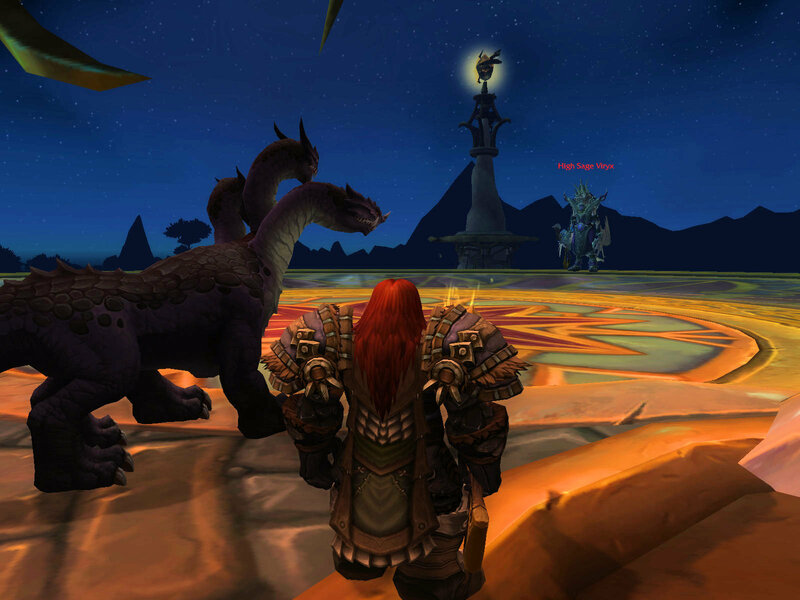 That puts the group half way through the eight normal mode instances in Warlords of Draenor. The remaining four all require the group to be level 100 to walk in, so it is time to start leveling up. Everybody in the group was close to 97 by the end of the night, though both Ula and I had turned off experience in order to not get too far ahead. We can turn on exp now, and I think almost all of us were 97 before the end of the weekend. But with our varied play schedules it may be a while until we all hit the level cap and can pile into The Everbloom, the next instance on the list. 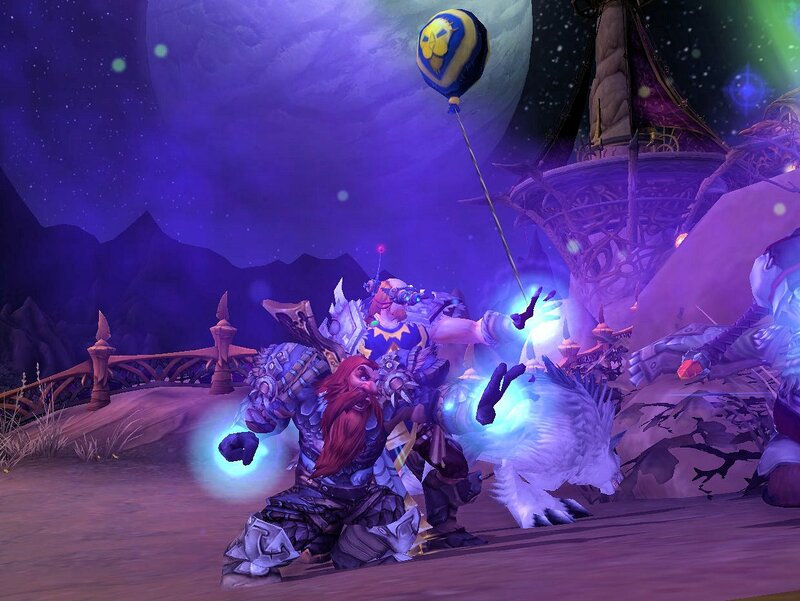 This entry was posted in entertainment, Instance Group, World of Warcraft and tagged Skyreach, Warlords of Draenor on April 16, 2015 by Wilhelm Arcturus. It seems possible that whoever had the lead in your 4×100 group had their dungeons unknowingly set to heroic. Especially if said leader was an “insane fury warrior” with “all the upgrades”. 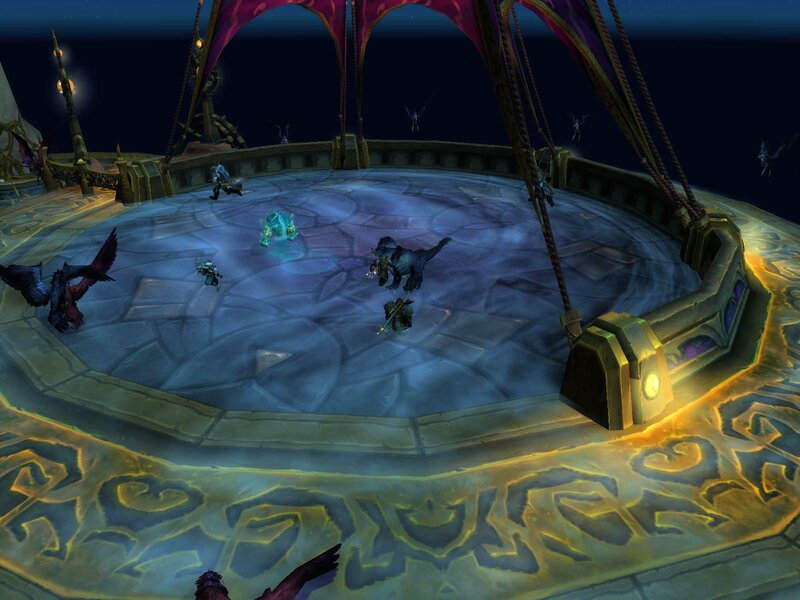 @Onwuka – That is possible, though I would hope we were not so dense as to fail to notice that all of the mobs in a level 96 dungeon were level 100. I am more comfortable with the idea of us simply being incompetent, with three of us playing characters we don’t usually use to group up.